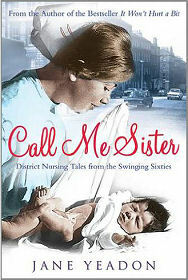 "Call Me Sister" is the third volume in Jane Yeadon's recollections of her life as a nurse in the 1960s. Her first book, "It Won't Hurt a Bit", dealt with her initial training, while "It Shouldn't Happen to a Midwife" led us through her midwifery training at the Royal Maternity Hospital in Belfast just before the start of "the troubles". Readers who enjoyed the well observed yet gentle style and the quiet humour of the first two books will be looking for more of the same from the third, and they certainly won't be disappointed. We first encounter the author, then known as Jane Macpherson, as she is being taken to task by Sister Gall over a missing teaspoon on their ward in Inverness's (old) Raigmore Hospital, an event that does nothing to dispel her long-standing ambitions to become a district nurse. Even though Sister Gall does mellow when she realises that Jane's skills as a midwife have greatly benefitted a patient, Jane wants more from her life than the inside of a hospital ward. So we follow her as she embarks on a new chapter in her career, as a district nurse, at first in and around Conon Bridge and later in Fortrose. Jane finds a very different world to the one she is used to, a world in which self reliance and the ability to deal with emergencies are prized assets. And a world in which driving the small ill-equipped cars of the era through snow, ice and fog decades before mobile phones were dreamed of was seen as a routine part of winter life in the Highlands. What really makes Jane Yeadon's books so readable is the humanity that shines through her accounts of her interactions with her patients, and her ability to tell stories that show that she has failings like the rest of us: such as the account of the ambulance driver and heavily pregnant patient chatting in the back of the ambulance while Jane is standing outside, suffering from travel sickness. There is also some very nice writing in here. The description of Edinburgh as a place that "wore history like a fancy-dress, and having found it fitted, kept it on" is one we wish we'd thought of ourselves! Jane Yeadon is a native of Forres and she trained in Aberdeen as a nurse before undertaking further training in Belfast and Edinburgh and becoming a district nurse. Will there be further books in the series? A lot of readers will hope so.